One thing I love about technology is that there is something always new that will never fail to amaze you. Some ideas may be a "rehash" of an older concept, but the way it is redone suddenly makes it become the topic of the day. Take for example, the case of the projectors. I still remember the mid-90s when I worked with a Systems Integrator company in the Philippines. We bought an LCD projector which was a huge leap from the transparency projector at that time. We loved using it. However, it was also bulky, so much so that it had its own suitcase with wheels, much like luggage used for long trips abroad. So whenever we had a presentation for a client, we looked like we were going away for a couple of days. Now, thanks to man's incessant need to make all things as portable as possible, we now enter the age of pocket projectors. 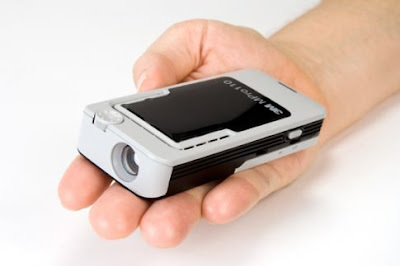 Projectors that... umm... fit in your pocket! These projectors use an LED for the light source and some truly miniaturized DLP components to make everything fit into a palm-sized container. 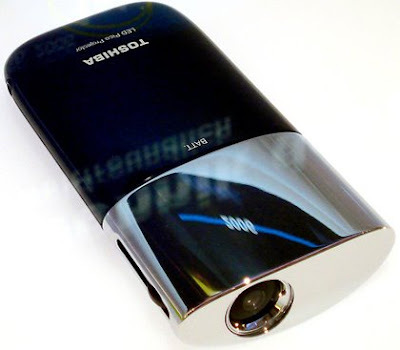 Of course, you cannot expect to make a presentation or show a movie in front of, say, 50 people, but for a small business meeting or even with friends, this gadget can definitely impress! I'm sure there are still others out there. And being new toys, I'm quite positive that they also carry quite a hefty price tag. I hope that a lot more companies will be producing such devices and that the demand will increase, so that the price will eventually drop. Think of the many applications such a gadget can allow! That's nifty! So much better than those bulky projectors we still carry around to meetings! flabbergast, the small objects that can be used for business meetings, how much this price ? Toni: Isn't it? I remember our first office projector... you had a haul around luggage with you! llham: When I posted this, the product was still fresh on the news with a "call now" for pricing... but I'm sure it will be quite expensive, as most small gadgets are.